The weeks are dragging now as I can’t wait to get to Mustang Maniac and do more to my car, things that are done now are very visible. I wasn’t sure what was going to happen, but a conversation with Adam and Yogi soon had me focused on the plan of action. The fuel tank I had with the car looked OK, all be it painted a little tired looking, but on full inspection using their internal camera showed some rust around the sender fitting and internal lower seams. To be on the safe side Adam ordered me in a special fuel tank. Not sure what to expect I was sent of to go and pick it up from the stores, oh boy, I was not disappointed. A full polished stainless steel tank was my new bolt in part. We had to clean up the trunk from light dust to allow the sealer to stick the paint and that in turn would not allow any fumes into the car and stop vibration. Yogi applied the sealing strip around the edge and we both removed the plastic wrap from the tank. Now at this point we were both very careful as the inner stainless edges of the tank are razor-sharp. The tank was eyed into position and laid onto the sealer strip, the holes were lined up ready for the bolts. The next step was the filler tube, gaskets, screws, clips and rubber. Previously I had cleaned up the tube, clips and rubber. Adam had a look at my cleaned up rubber tube and chucked it in the bin with a laugh. He was of course right, although it looked pretty good but not brilliant, I would always thinking to myself that it should have been a new one. We fitted the gaskets onto the filler pipe and feed the tube through the rear panel, the rubber was slid up the pipe and the clips roughly fitted. The screws to the back panel were tightened only as a rough guide to stop it turning. The rubber was slid down the pipe to the tank and clamped in place and the pipe screws fully tightened up. The next job of the day was a slow process but brings this classic Mustang back into the twenty-first century. The task was a specialised stick on matting that will stop any road noise and metal resonance through the car. This particular matting was a special order via Adam, the matting is only a couple of millimetres thick with a very sticky backing. 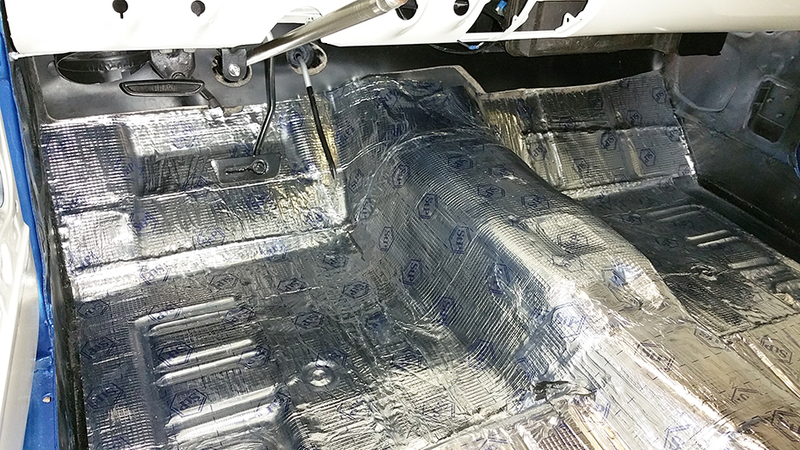 It’s applied like sticky back plastic and heated with a hot air gun to make it easier to mould the mat into place. Yogi showed me the first steps and left me to get on with the task in hand. I found this very therapeutic with instant visible results. First step make sure the floor holes have the correct plates in place with a little sealer around the edges to stop water ingress. Second step was to lay the matting. We started from the centre and worked our way out to the edges. Peel a little of the backing and position in place then roll the matting across the surface smoothing down as much as you can. The hot air gun softens and allows the mat to be pressed into place with the idea to make as much surface contact as possible. Like laying a complex carpet the pieces should fit together and form a complete coverage, this set of pictures shows my thought process. I started with the front foot wells, bulk head or fire wall up to the insulating matting, then moving onto the rear foot wells. The seat platforms were covered each side and the last parts was the remaining section of the centre tunnel. Under the rear seat will need to be completed as will the door panels and inside the kick panels, but as the time was getting late (very late), I decided to call it a day (or night) for now. The results so far look amazing. OK, so this matting is not cheap and weighs in a little, but the benefits are well worth it for a weekend cruiser. Over the last couple of weeks I have been asked what was used to get the effect of paint job. Well you need somebody who knows what he is doing, in this case that was Paul who had patience and dedicated time to complete such a fantastic job. The ingredients he used are listed below, but this does not include the cleaning chemicals, rolls of masking tape, rolls of masking paper or surface wipes etc etc. As you can see Forty Three litres of sprayable materials in total and one litre of brushable seam sealer. I was thinking last night that as the trunk now looks so good, there is a very good possibility that I wont put carpet over the whole trunk floor, just so I can see the fuel tank and great the paintwork. The stainless steel fuel tank will visible from behind the car of course. What do you think I should do, carpet or not carpet the trunk? This entry was posted in General and tagged 2K paint, Acapulco Blue, base coat, Dynamat, etch primer, fuel pipe, gasket, masking tape, metallic, Mustang, Mustang Maniac, One man and his Mustang, primer, rubber pipe, satin black, Stainless Steel fuel tank, surface primer, underbody coating. Bookmark the permalink. Wow! You must be pretty proud of how it’s all coming together, now? 😀 Beautiful! Thank you. I can’t deny it I am delighted how it’s all coming along. Wirering soon. Making ever more progress. I just got back from the Super National Car Show. There were a lot of great classic and custom cars there. I thought about you Mustang. Thanks for the thoughts, will you be posting pics of the show? Beautiful tank! I know you can’t wait to fill ‘er up that first time! So lookin forward to that, thinkin of not having a carpet in the trunk as it looks so good!